This is a complete catalog of all of our stock moldings shown in profile form. Many of these traditional moldings are less expensive than the big box stores. Click here to download Wood Innovations’ catalog of stock moldings. You will need an Adobe Acrobat reader to view the catalog. Download our catalog and see what we can do for you! Wood Innovations has been a leading producer of architectural molding since 1983. Located in Saint Louis’ Benton Park neighborhood, a center of historical architecture and preservation, we specialize in matching the handcrafted woodwork of historic homes. In addition to our custom work, we also offer two economical alternatives. We stock roughly 100 moldings; profiles of these can be found in our Stock Catalog. We also have a collection of more than 1600 knives, which we can run at anytime. The profiles associated with each knife can be found in our Full Catalog. Moldings found in either of these catalogs are ideal for those developers or restorers working on projects which have very little to no original woodwork. We at Wood Innovations operate with two guiding principles: historical accuracy and quality. We appreciate the elaborate adornment found in historic homes. Our goal is preserve these qualities in our work. To achieve this goal we start with high-grade lumber, which is more consistent in density and color. We create our knives within 1/64” of accuracy and we keep them sharp, which awards smoothness to the surface and sharpness to the shape of the molding. Through the years, we have accumulated a collection of trim and molding profiles, all of which came from our clients, who specialize in historical restoration. Therefore, this catalog is really an anthology of architectural moldings found in historic homes of the St. Louis area. The collection includes over 1600 moldings and is composed of crown mold, brick and window mold, casings and plinth blocks, porch rail, chair and picture rail, and more. Wood Innovations’ full online catalog will be available soon. We realize many historic homes have been neglected and, as a result, restorers have very little to no original molding to work with, which is why we stock some moldings. The items in this catalog were picked, from the larger catalog, because they were found frequently in historic homes in St. Louis. Our interior trim comes in poplar or pine and exterior trim in fir, often at more competitive prices than big-box hardware stores. 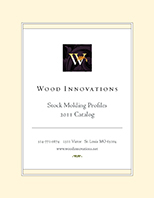 Click here to download Wood Innovations’ catalog of stock moldings.